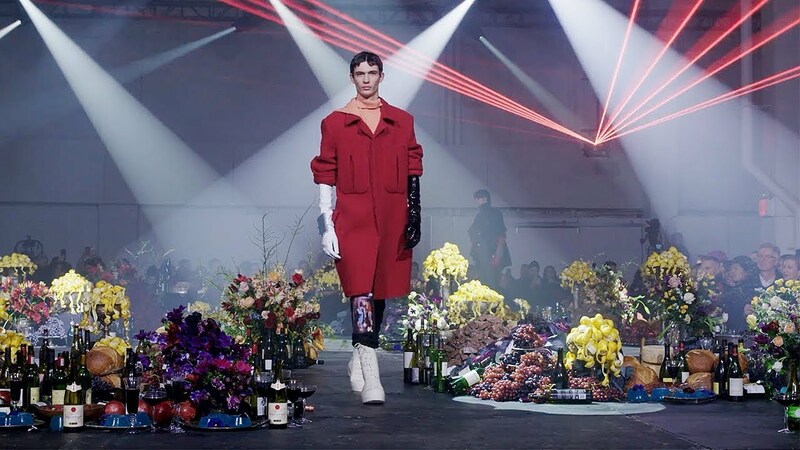 The baroque feast of Raf Simons’ latest presentation with mountains of fruit and chocolate, breads and cheeses, bottles of wine and artfully arranged floral bouquets, was one of the most discussed sets of the season. It was curated by the Antwerp-based florist and Raf’s long-time collaborator Mark Colle, who magic'd up the boxed-in bouquets at Simons' last show for Jil Sander and the floral walls at Raf’s debut show for Dior. Having created arrangements for Ann Demeulemeester and Dries Van Noten, he's become one of the most significant figures in floristry. I had a chat with Mark about his interpretation of a brief of "flemish painting, drugs and techno" and the time he tried to put Raf himself into one of the Dior flower walls. you created the flower arrangements for raf simons’ latest presentation in new york. what was raf’s brief? what flowers did you use? The brief was quite simple: flemish painting, drugs, techno. I used mostly flowers inspired by the old Flemish masters: tulips, poppies, Queen Anne’s lace and a lot of black and very dark flowers. I absolutely love the fact that nothing I create lasts long. I would probably even find it depressing to know that everything I ever made still floats around somewhere on this planet. I like that everything is so instant. You can not start making something with fresh flowers, let it sit there for a week, and then continue. I think that’s what I love the most about what I do: there’s no time to think too much about it or reflect on it for too long. And colour. I’m obsessed with colour. did you decide to connect your life with floristry intentionally? Not at all, it was a happy accident. I dropped out of school when I was fifteen and started working in a local flower shop. This happened twenty-four years ago but not once did I think, “Oh, I want to become a florist”. I ran away from it a couple of times even, but always came back. I never really was into the whole fashion world, so I had to do some research and while it was easy to connect roses or the pink colour to the house of Dior, I wanted to add Raf Simons to the mix as well, like the electric blue delphiniums or the acid yellow goldenrods. the wall with blue delphiniums was my favourite. is there a particular flower you associate with raf? your flower arrangements for raf’s final show at jil sander (fall 2013) gave a feeling of sorrow and celebration at the same time, can you talk me through those circumstances? I think it was because of the events that surrounded the show (Jil Sander’s return to her brand). It was very emotional indeed. Also, till this day, it was the show that has had the most impact on me emotionally. It was my first job abroad and my first introduction to the fashion world. I prepared the arrangements in basically the same space where Raf was doing fittings and I had absolutely no clue of the impact this would have on my professional life. Each arrangement meant to tell a different story and, in a sense, this was more difficult than the first Dior show, overwhelming as that was. it was a rare moment in fashion when flowers were used not just for the decoration aspect, but they had a meaning too. There was definitely a meaning in them: a day in the life of a woman. what are the downsides of being a florist, if there are any? Waking up early, for sure. That is something I will never get used to. And time. More often I look first at the clock and then at the remaining flowers that need to be used, and start to shout very nasty things.